Solanum nodiflorum (or Solanum americanum ssp nodiflorum) is a weedy plant that is common in this region. This plant is a member of the genus Solanum, and is part of the confusing Solanum nigrum complex that contains similar looking plants. As with other members of the Solanaceae family, most parts of the plant contains the toxic glucoalkaloid solanine and related compounds, albeit in different quantities. The unripe, green fruits are known to contain significantly higher quantities of solanine and hence are considered poisonous and should not be eaten. The ripe fruits however, have very much lower amounts of such compounds, thus are eaten by various groups of people where this plant is found. 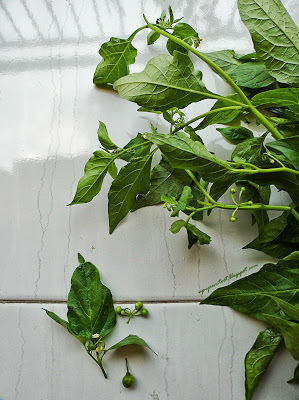 Sayur meranti/ranti (龙葵) - Solanum nodiflorum. The unripe fruits are green in colour. 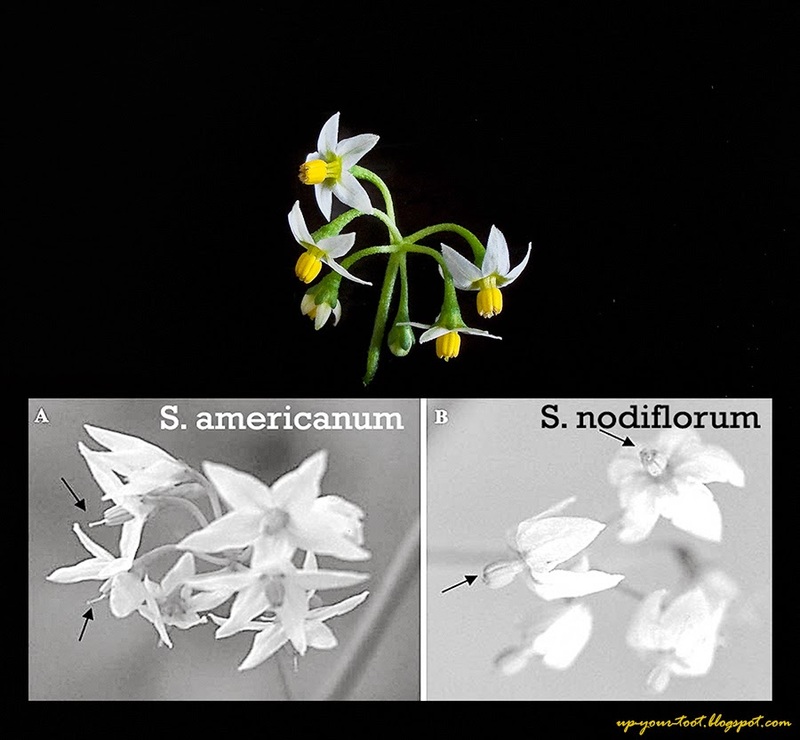 As a member of the Solanum nigrum complex, Solanum nodiflorum (White Nightshade) is considered by most people to be conspecific with S. americanum (少花龙葵), but molecular studies by Manoko et al. (2007) indicate they are different. Other than the genetic differences, they are visibly different in that the flowers of S. americanum has exserted style 2.5mm or longer; for S. nodiflorum, it is usually not and if they are exserted, the style would be no more than 0.5mm higher than the anthers. Furthermore, plants that are known as Solanum americanum in Malaysia, Singapore, Australia and New Zealand are most likely to be S. nodiflorum. On page 8 of the paper by Manoko et al. (2007), one can clearly see the difference in the style length. I have taken a photo of the flowers of a local sample obtained from a night market and inserted the one from Manoko et al. as a comparison. It can be clearly seen that they are S. nodiflorum. The flowers from sayur meranti. When compared to that from Manoko et al. (2007) (lower inset), the style is not exserted like Solanum americanum but resembles that of Solanum nodiflorum. 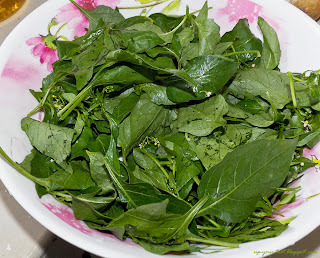 Locally known as sayur meranti or sayur ranti, the tender shoots and leaves of S. nodiflorum are cooked as a vegetable. Considered a forage food or village greens, it can be hard to get at local wet markets due to the short shelf life of the vegetable, for they wilt quickly once picked and easily turns mushy rather quickly if kept too moist in an attempt to keep them from wilting. In some countries, this plant is only eaten when better vegetables are not available. A seller was selling them for RM1 a small bunch or RM2 for three small bunches at Bandar Baru Ampang night market. It was the flowers, typical of the nightshade family that caught my attention and made me walk towards the stall. 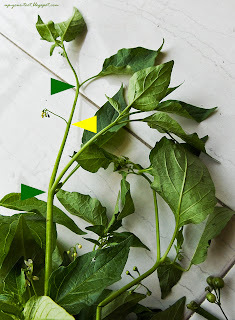 Another interesting feature of Solanum nodiflorum (or Solanum americanum) is the flower stalks that are usually extra-axillary, meaning that they emerge above a leaf node, and not from the node itself. Only very rarely do you find an axillary flower stalk on the plant. The extra-axillary inflorescence of Solanum nodiflorum. The green arrows indicate the position of the leaf nodes. The yellow arrow points to an inflorescence, indicating its extra-axillary position. Rarely do they produce axillary inflorescence. Besides being just another 'kampung' vegetable, this plant is considered medicinal by many. It is widely used as a vermifuge and febrifuge in Africa. The Chinese consider the plant as anti-inflammatory, heat dissipating, blood stasis dissipating and promoting subsidence of swelling. Some local people here consider it a traditional cure for high blood pressure, but some caution its use by people with hypertensive condition. This is understandable as the plant contains various alkaloids that may affect the way our body corrects blood pressure. Thus at different doses and together with synergistic effect of other compounds, it is difficult to predict our body's reaction to these compounds in terms of blood pressure control. Likewise, it is also difficult to predict how someone with a heart condition will react to the alkaloid contents of this plant as quantities of the alkaloid can vary from one plant to another, how the vegetable is being prepared, amount consumed and the duration of consumption. Leaves and tender shoots of Solanum nodiflorum washed and ready for the stove. Medicinally aside, it remains as a popular local vegetable and people who like it often rave about it, especially the 'bitterness' of the vegetable that is perceived as being good for the body. Some even go to great lengths to procure this vegetable. If you are a person who finds bitter gourd, wolfberry leaves and other bitter vegetable interesting, chances are you will like the White Nightshade. The leaves and tender shoots of Solanum nodiflorum were picked and washed, making sure that no unripe berries were accidentally added in. If you prefer the dish to be less bitter, use only the tender shoots and small leaves. The leaves were then blanched in boiling water (to which some table salt had been added) for about 2-3 minutes. The water was drained and the leaves were washed in tepid water twice to keep it from wilting further and to remove the bitterness (and the alkaloids). Next, washed dried shrimp (amount as desired) was fried in about two tablespoons of oil until fragrant (you can also add garlic and some onions). Then into this shrimp, the blanched nightshade was added and stir-fried at high heat. Soy sauce was added to taste and after a quick stir; the vegetable was taken off the stove and plated. 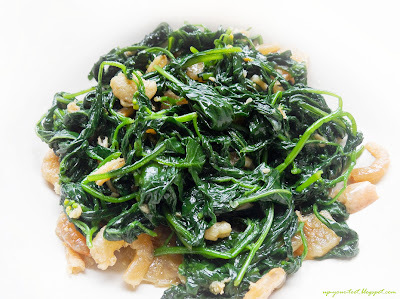 Stir-fried White Nightshade Greens with Dried Shrimp/龙葵炒虾米/Sayur ranti tumis udang kering. The dish has a mild bitterness that kicks in after a while, but otherwise very much like any stir-fried Asian greens. A note though: I experience a mild tingling and flushing feeling after consumption of the vegetable; the feeling that I get when exposed to acetylcholine esterase inhibitors like organophosphate pesticides. Perhaps I should have used only the young tender shoots. Hehehe, lupa pulak nak tambah cili api. Diana pernah makan buahnya yang dah masak tak? Some people say like Physalis, interested to find out how it taste like tapi takde pula buah yang masak dalam sayur yang dibeli. You are right about purple sweet potato - baru sebulan tanam dah keluar flower buds. Tak pernah cuba lagi buahnya. Comparing the flower yang americanumnampak bucu tajam lagi. Kena rajin buang kut flowernya. I thought you know due to day lenght at first tapi you tanam pun dah different season. Sunchoke berbunga ikut day length. Masa I tanam end year tak bunga bila tanam nak dekat midyear keluar bunganya macam sunflower tu. I takut tikus gali je sekarang. Tengah proses biak lagi sendiri.pun tak.dapat nak.makan sangat lagi. Yup, stigmanya menonjol keluar sangat, manakala nodiflorum stigma sama rata atau tinggi sikit je. Mungkin jenis purple nih kuat sangat daya nak bunga, ke ingat dia sendiri morning glory, hehehe. Ok, kena mulakan operasi buang flower buds. Wah, Diana buat garden jadi Australian spring, eh? Fig cutting yang I baru dapat dari ADL pun buat macam spring kat sini, keluar daun dulu. Tikus tu mesti gembira hidup kat garden u, dapat makan semua jenis ubi dan akar. I think in the US, the one that is deadly is the deadly nightshade - they have fruits that are born singly. The rest of the nightshade have fruits in clusters. Even the black nightshade is edible. I will be linking this post on Tuesday if you don't mind? Not at all, go ahead. Sorry lambat reply sebab tak buka blog. Evaluation of Antimicrobial Activity of Crude Methanol Extract of Solanum nodiflorum Jacq (Solanaceae). Hi..pokok ranti ke namanya...kat tempat sy, kami pangggil sayur tutan...ada dua jenis, yg btg gelap dan yg cerah mcm dlm post...yg cerah ni sangat pahit berbanding dengan yg gelap..sayur ni mmg bnyk khasiat...tumbuh melata di kebun sayur..